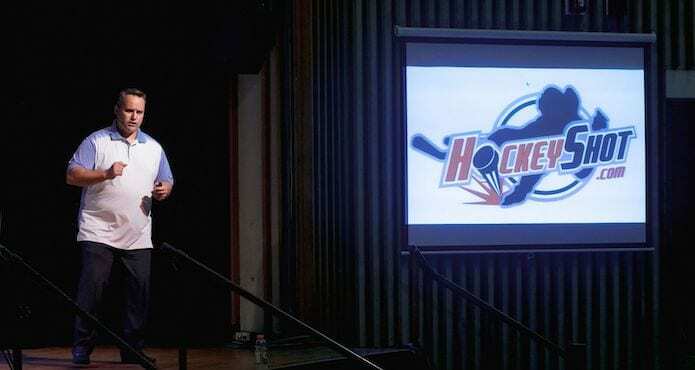 John Becanic’s presentation at our 2018 Hockey Coaches’ Conference in Toronto delivered the essence of a movement hockey coaches all over the world are looking to capture. Which is a slow way to say “John taught us how to coach players to play fast.” Much simpler. If the player senses you’re not confident in your delivery, they’re not going to buy in. For Becanic, teaching young hockey players to play fast starts with the coaches’ delivery. When you coach with confidence, you take the guesswork out of the game. your confidence in the material leads to your platers’ confidence in you, and ultimately, the message or skill you’re delivering. You have to start thinking quicker. If you think quicker, your hands will get quicker. Transitional thinking is an important piece of the puzzle. Offense to defense to offense. When you do get the puck, what does quick mean? Do you move it quick or do you dust it off? Don’t give your players the option of playing slow. John’s delivery was a powerful message to all the coaches in attendance, so check out the trailer below or watch the entire presentation with a TCS membership.